Hollywoodnews.com: This year, virtually every Oscar category boasts one or two candidates that you simply know will be in the race, and then seven or eight potential nominees who are all jockeying for the remaining slots. More than any other year in recent memory, there are too many qualified actors and actresses vying for Oscar recognition in their respective categories. And while I trust in the Academy to find the five best talents to fill the open slots, you just know there will be deserving people on the outside looking in coming Tuesday, Jan. 24. Harrelson reteams with Moverman for “Rampart,” a semi-modern film noir with the actor playing a dirty cop who’s sinking in the quicksand of a media-heavy scandal. I spoke with Harrelson at length about his collaboration with this director, his opinion of L.A. law enforcement, and a tease for “The Hunger Games.” Here’s Woody Harrelson. HollywoodNews.com: Your performance in the film is so riveting, so intense. Woody Harrelson: Oh, thank you very much. HollywoodNews.com: Dave Brown was a tough character for me to walk away from, and I only spent two hours in his presence. How did you manage to put him away after a lengthy shoot? I guess it did take a couple of minutes to shake off. But my best remedy is going to Maui and hanging with my family. That really does help. A little nurturing atmosphere helps put you right back in the pocket, so to speak. No, not really. I did with Ron Shelton [for “White Men Can’t Jump” and “Play It to the Bone”]. Other than that, though, I really haven’t. Oliver [Stone] did “Natural Born Killers,” and then he executive produced “Larry Flynt,” so I consider that two movies with him, even though he didn’t direct the second one. HollywoodNews.com: Is it just a matter of you seeking fresh creative partners? Nah, that’s just the way that it worked out. I liked working with all of those guys, and would be happy to work with them again if the right thing came along, you know? HollywoodNews.com: With Oren, was it a matter of wanting to get back together and create a new vision? Well, yeah, with Oren it kind of was a conscious decision to work together again. I still feel that way. I just love working with him. I think he’s one of our great directors. I love his style of work. And by now, he’s like a brother to me. I feel like he’s a genius. He challenges me. You see how much heart and soul he puts into [a project], and you want to do the same. 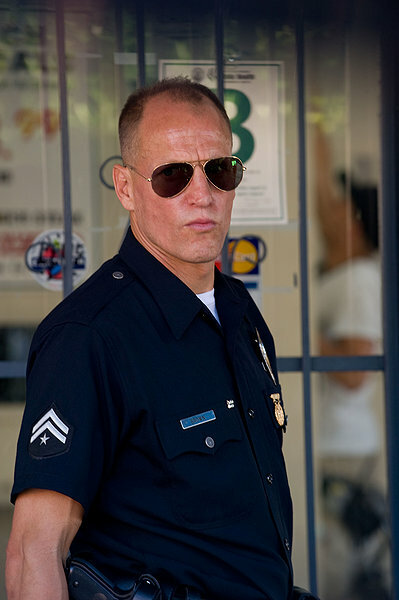 HollywoodNews.com: Having played a police officer on screen and researched the job for the role, do you think it’s possible for a cop to be effective on the streets and still stay clean, to play by the rules? Oh yeah. I think mostly they are good guys, and clean. But there’s obviously going to be a few who would make you think otherwise. But I think it’s a very small minority of bad cops. HollywoodNews.com: Do you think it’s more interesting to play a dirty cop? I think so. Playing a clean cop wouldn’t be nearly as much fun. You wouldn’t find as many layers to explore. HollywoodNews.com: With all of the action going on in the streets in “Rampart,” I found myself more interested in Dave Brown’s home life, where he’s living communally with two sisters who he obviously has had physical relationships with. Well, I think that really gets down to the core of who Dave Brown really is. The family, and his love for that family. When that starts to fall apart, then it really cuts him. To me, though, that’s the root of who he is, even though it’s an odd relationship, living in between two sisters, both of whom he has a daughter with. It’s a little strange, but that’s Shangri-La to him. And then when all of that starts to get threatened, I think that’s when his paranoia sets in. HollywoodNews.com: I’m curious if anyone handed you any books by Robert Crais. Actually, yeah, I’ve heard of him. HollywoodNews.com: He writes these modern L.A. noir stories, and there’s a character in the books named Joe Pike who I never thought could be accurately portrayed on screen until I saw you playing Dave Brown. You know, I read a lot of different things in preparation for this role, but they were mostly factual, and not so much fictional. But a close friend of mine did mention that very author, saying it was some of the best stuff to read. How many books has he written? HollywoodNews.com: Close to 15, maybe? The books are so good, and I kind of wouldn’t want to see them adapted because I’m not sure the film industry would get them right. But seeing you in “Rampart” gives me a little bit of hope. Well, which book would you recommend? HollywoodNews.com: If you are going to get into them, I’d say start at the beginning with the first book, “The Monkey’s Raincoat.” You’ll burn through all of the stories. They’re a tremendous read. You know, that movie has the potential to be great. Gary Ross directs it. Each one of the department heads, from make-up to hair to wardrobe to set direction … everybody is working at the absolute top of their game. All of the actors have a terrific script. I really think it’s going to turn out great. I really hope so.